So pretty. Love all the colours and different textures. Lovely color combo...I would love for you to link up with my new card making meme, 52 Card Pickup here...http://www.oldbackporch.com/2012/01/52-card-pickup-week-1.html! What a lovely card! That bird die and leaf die are both on my wishlist! Love the textures in the embossed layers and the angle of the bird and the swirl..and the colors...just a perfect card! 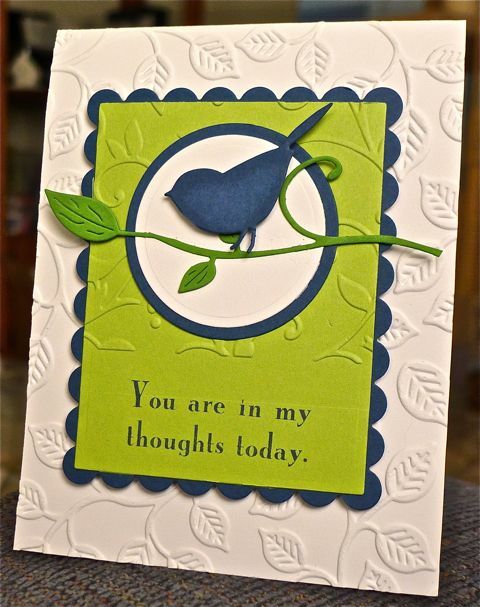 The colors and embossing make my heart melt, this is gorgeous!